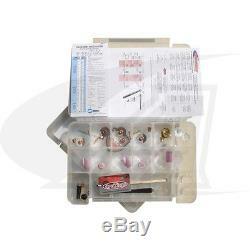 Gas Saver Pro Accessory Kit for Weldcraft WP-20 TIG Welding Torches - Standard Diameter Kit. Clear Pyrex Gas Lens Complete Kit. The Arc-Zone Weld Like A Pro Gas Saver Kit For common Series TIG Torches is the Ultimate Box of High-Performance TIG Torch Accessory Parts. Assembled by The TIG Welding Experts at Arc-Zone. Everything You Need To Optimize Your TIG Torch, and Get the Best Quality Welds -- Right out of the Box! Kit includes components to fit your desired size of tungsten electrodes. Item pictured to the right is a Large Diameter Kit. Please choose your torch series from the menu above: (Kits fit both Weldcraft and other style torches). Parts Compatible with All Popular Series TIG Torches from Weldcraft, WeldTec, TecTorch, CK, Radnor, BestWelds, Master TIG, Profax etc. Deluxe (Includes both Standard and Large Diameter Components). Gas Saver nozzle kits provide an inert atmosphere for the welding of reactive metals such as titanium, molybdenum, nickel-based and aluminum based alloys as well as non-reactive metals like stainless steel. Gas Saver kits can be used for a variety of TIG welding applications in many cases replacing bulky and expensive trail shields. The Large 1-1/8 (28.5mm) orifice pyrex glass nozzle is lightweight for improved operator comfort, torch control, and provides excellent visibility of the weld puddle and tungsten electrode. Designed with a replaceable tungsten adapter and universal collet for low-cost screen replacement. With a Gas Saver nozzle kit you can achieve high-quality welds on a consistent basis and the shielding properties allow for tungsten stick-out of up-to 2 (50.8mm). Standard Diameter Gas Saver Pro Kit Includes. Standard Gas Saver Nozzle Series, #4, 5, 6 , 7 and 8 x 1 Long (4, 5, 6 , 7 and 8 x 1 7/8 for 17, 18, 26, CS410 Series Only) Pyrex Nozzles. 040" (1.0mm), 1/16" (1.6mm), 3/32" (2.4mm) and 1/8" (3.2mm) Wedge Collets and Standard Tungsten Adapter with Screens. Push-On Standard Pyrex Clear Cup for improved visibility. 4 = 1/ 4 (6.4mm), No. 5 = 5/16 (7.9mm), No. 6 = 3/8 (9.5mm), No. 7 = 7/16 (11.5mm) and No. 8 1/2 (13mm) Alumina Push on Nozzles for use with Gas Saver Front End Parts. Stubby Gas Saver Accessories (17, 18, 26, CS410 Series Only). Stubby Gas Saver Nozzle Series, # 4, 5, 6, 7 and 8 x 1 Long Nozzles These Nozzles Use The Same Wedge Collets As The Large Diameter Gas Saver Nozzle Series. 040" (1.0mm), 1/16" (1.6mm), 3/32" (2.4mm) and 1/8" (3.2mm) Standard Tungsten Adapter with Screens. Push-On Standard Pyrex Clear Cup for Improved Visibility. Long Back Cap, Medium Back Cap and Short Back Cap. ArcTime Brand Hybrid Formula "Multi-Use" Non-Radioactive Tungsten Electrodes Sizes: 040" (1.0mm), 1/16" (1.6mm), 3/32" (2.4mm) and 1/8 (3.2mm) diameter, 7" Long -- Color Code: Sky Blue. High-Quality Storage Case and Lid Card with Part Number Reference for Easy Re-Ordering. You Get a Handy TIG Welding Calculator -- and -- Joe Welder's "Guide to Optimizing Your TIG Torch". The Popular Articles on "How-to-Select". "How-to-Grind" Your Tungsten Electrodes for Optimum TIG Welding Performance! Large Diameter Gas Saver Pro Kit Includes. Large Diameter Gas Saver Nozzle Series, 1-1/8 Diameter Pyrex Nozzles (9, 20, CS310 Series Only). Large Diameter Gas Saver Nozzle Series, #4, 5, 6, 7 and 8 x 1-1/8 Diameter Pyrex Nozzles (17, 18, 26, CS410 Series Only). 040" (1.0mm), 1/16" (1.6mm), 3/32" (2.4mm) and 1/8" (3.2mm) Wedge Collets and Large Diameter Tungsten Adapter with Screens. Push-On Large Diameter 1-1/8 Pyrex Clear Cup for Improved Visibility. Deluxe Gas Saver Pro Kit Includes. 2091 Las Palmas Drive, Ste. The item "Gas Saver Pro Accessory Kit for WP-20 TIG Welding Torches Standard Diameter" is in sale since Friday, April 28, 2017. This item is in the category "Business & Industrial\Manufacturing & Metalworking\Welding & Soldering\Welding\Other Welding Equipment". The seller is "arc-zoneweldingsupplies" and is located in Carlsbad, California.